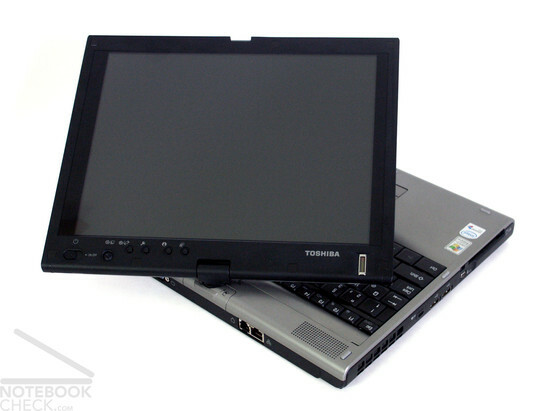 The current review of the Toshiba M400 Tablet PC represents a special event for us. Thereby, this is our 100 review. 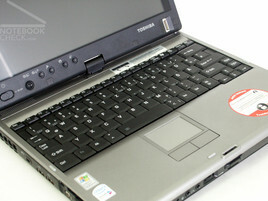 You will experience like always, what the reviewed notebook really is worth - so also with the Toshiba Portege M400. 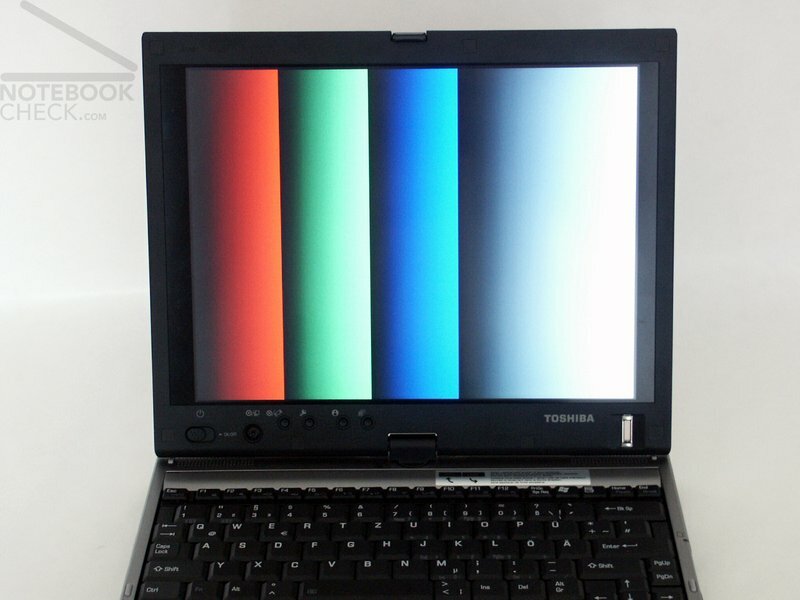 The Toshiba Portege M400 pleases due to the color choice. The base unit and the display edge are coloured in a strong black. The display cover and the top side of the base unit are finished in a kind steel silver metallic colour. Altogether, as a result of it, a high-quality impression arises. 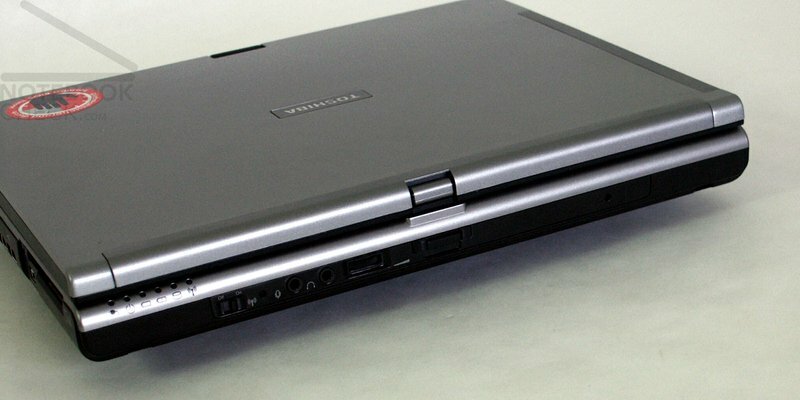 Due to the typical Toshiba alignment with straight edges and rounded off corner passages, the M400 also would be recognizable easily as a Toshiba equipment without label. The surfaces of the notebook feel well, but are disappointing after more precise investigations. Particularly within the range of the right hand surface (battery) the case can be incised easily and crunches quietly. 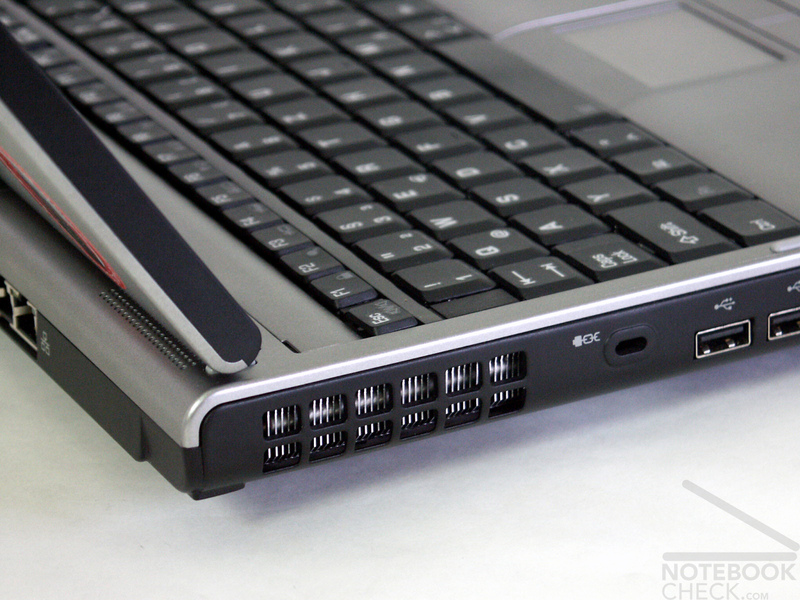 Also the strip above the keyboard sits not absolutely firmly in the chassis and can be moved somewhat. 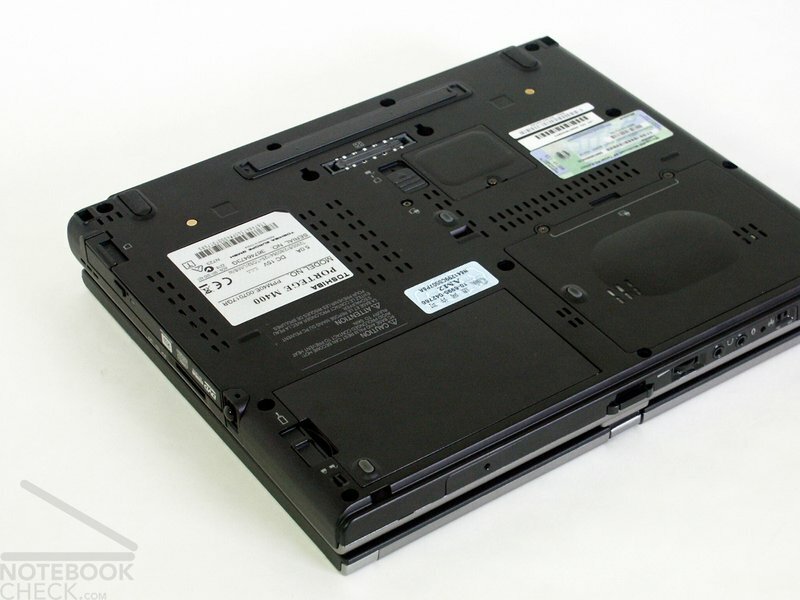 Except the battery, which is inserted into the case somewhat wobbly, the notebook is very compact and durable and also is very rigid against torsions. This applies also to the display. The display, which is held by a centrically arranged turning tilting mechanism, can be adjusted with pleasant force expenditure, but whips clearly. However, the turning folding mechanics actually makes a solid impression. 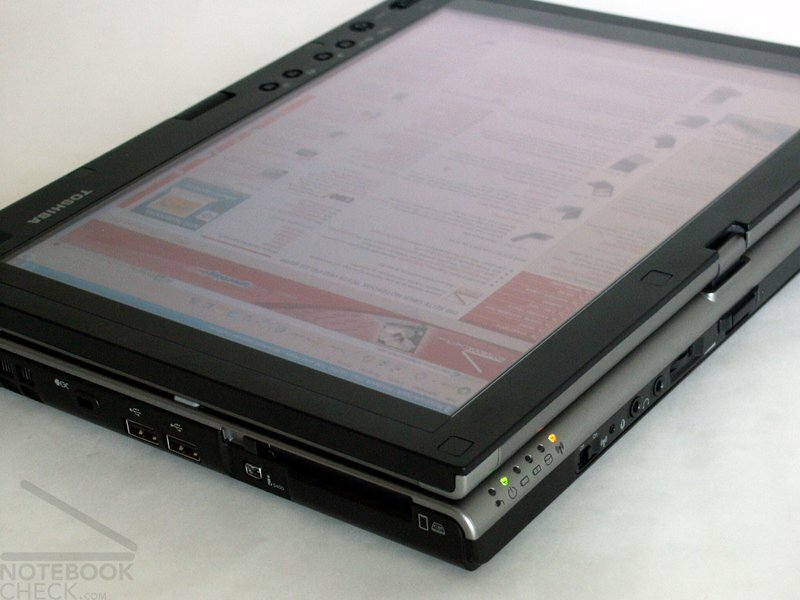 The display can be turned by this mechanism in a conventional position or be folded up as Tablet PC. Of course, the use of the mobile computer is also possible in all intermediate stages. Thereby particularly interesting is the bolting device mechanism. This can be locked by a stowable hook at the upper edge of the display both in the regular position and in the function as Tablet PC. Since the display can be fixed securely and firmly, this closing function is to be rated very good. 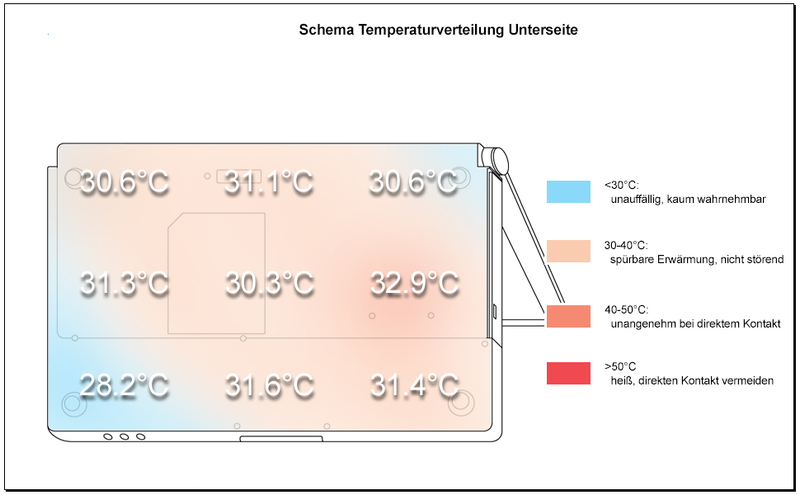 Without any exaggeration, the connections are distributed around the whole case: At the front edge there are headphones and microphone connection and also a WLan switch. 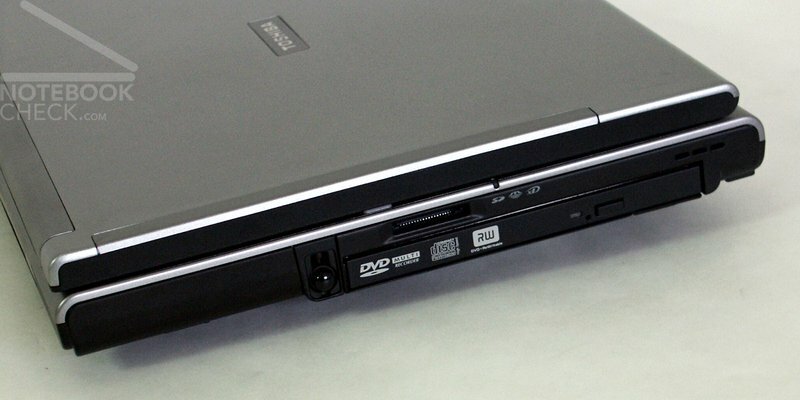 At the right side of the case the DVD drive assembly and a SDCard reader is accommodated. 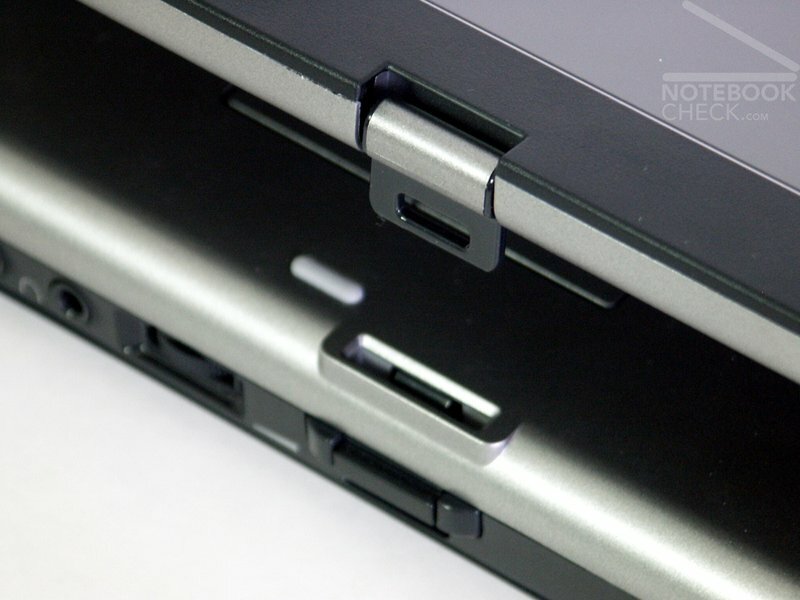 In addition, the provided Tablet PC Pen can be stowed away here in an opening. At the back the power connection, modem and LAN port, a USB 2.0 port and a VGA exit for the connection of an external monitor are positioned. At the left side there are two further USB 2.0 ports, a Firewire connection, Kensington lock and a PCCard slot. 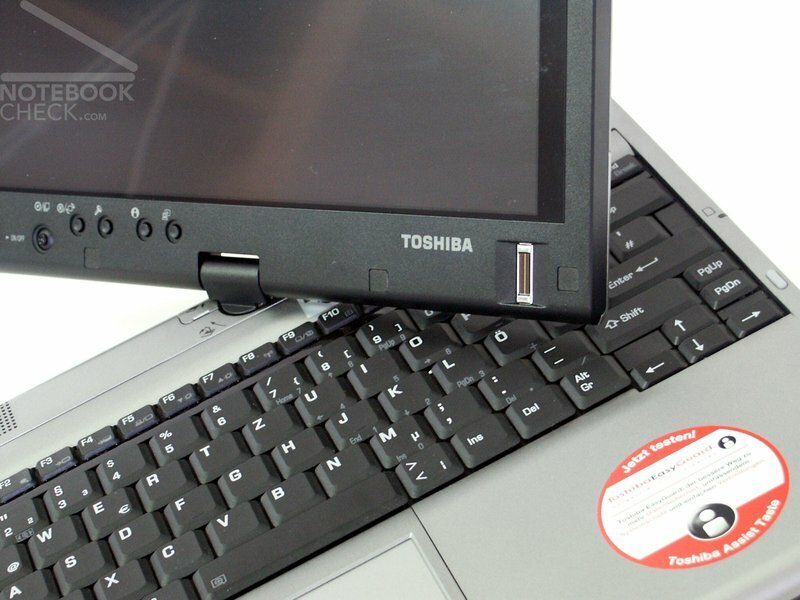 Beyond that the Toshiba Portege M400 offers a docking port at the lower surface of the chassis. As already mentioned, the connections are apparently arbitrarily distributed around the sub-notebook. Notetheless, after further examinations it is noticeable, that some ports become unnecessary and the audio connections are positioned optimally, particularly with the handling as Tablet PC . Remarkable with the keyboard is, that the available space was not used completely. On the one hand this improves the clarity, but on the other hand brings partly smaller finished keys, in order to be able to accommodate all functions. This concernes especially the space, enter and the cursor keys. Further it is to be marked, that the keyboard unit can be flexed particularly in the area at the right side. 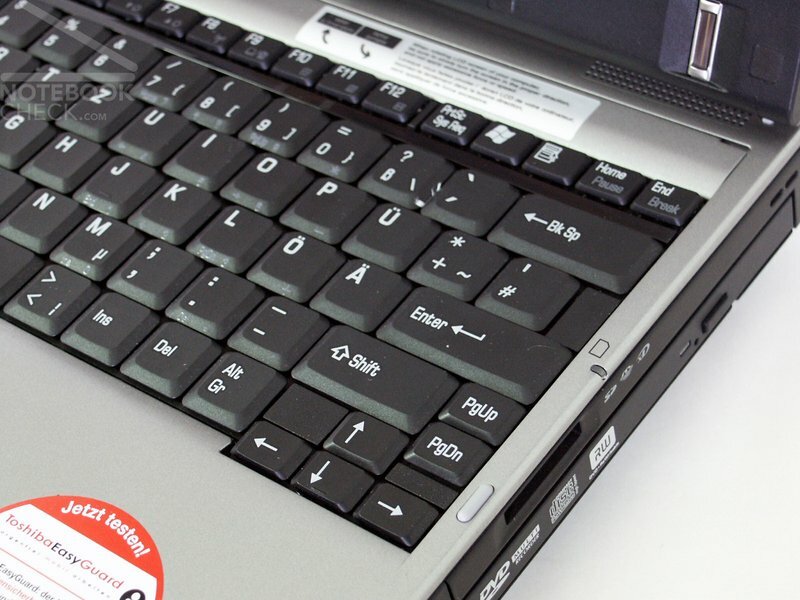 The pressure feeling of the keys features a slight resistance, an imminent pressure point as well as an easily fitting with springs stop due to the partial torsioning of the keyboard. 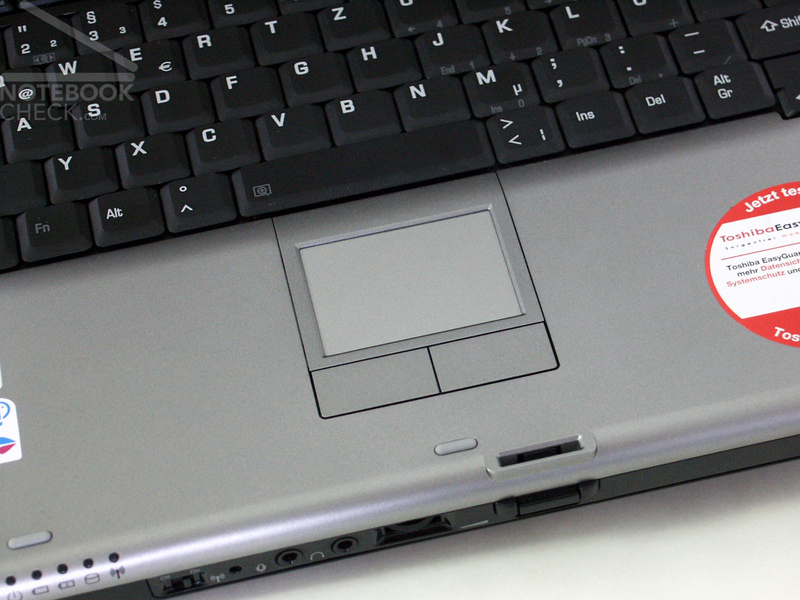 The touchpad is somewhat small and was inserted 1-2mm into the chassis. Therefore, often a re-placing with the finger is necessary and one often knocks at the border. Apart from it, the pad responds well and also the surface convinces by good sliding qualities. 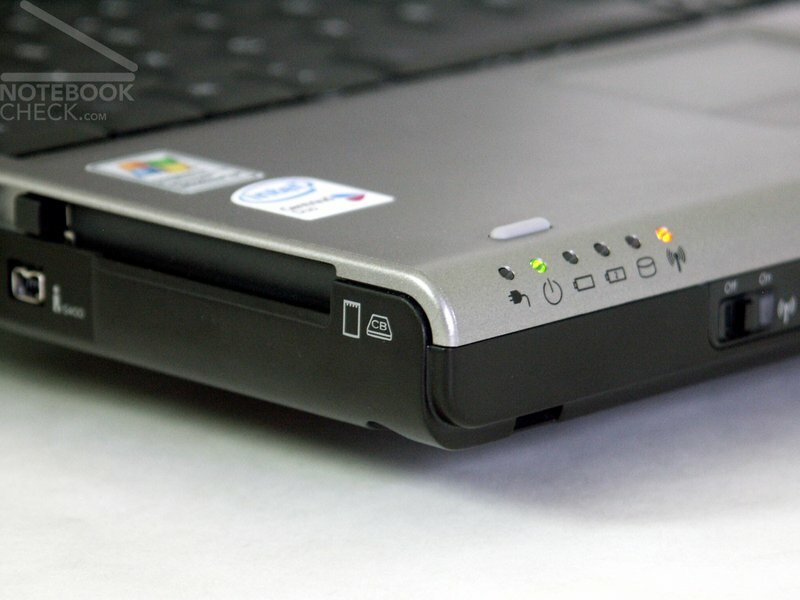 The two keys below the Touchpad are characterised by very good responding over the entire key surface, but create a rattling noise. At the beginning, the control by means of the Tablet PC pen turns out to be somewhat uncomfortable, but as time goes by, you will find out the trick. Then even the input of a small quantity of text is no more problem and can with the Tablet PC input area either with the help of a display screen keyboard, or in addition, can take place by means of a write field with coupled letter recognition. The Tablet PC pen actually lies well in the hand. The push button directly at the pin is inserted somewhat deeply and not particularly user friendly. Nevertheless, the display responds very well to the Tablet PC pen and reacts already with a distance of 1-2 cm above the display surface. 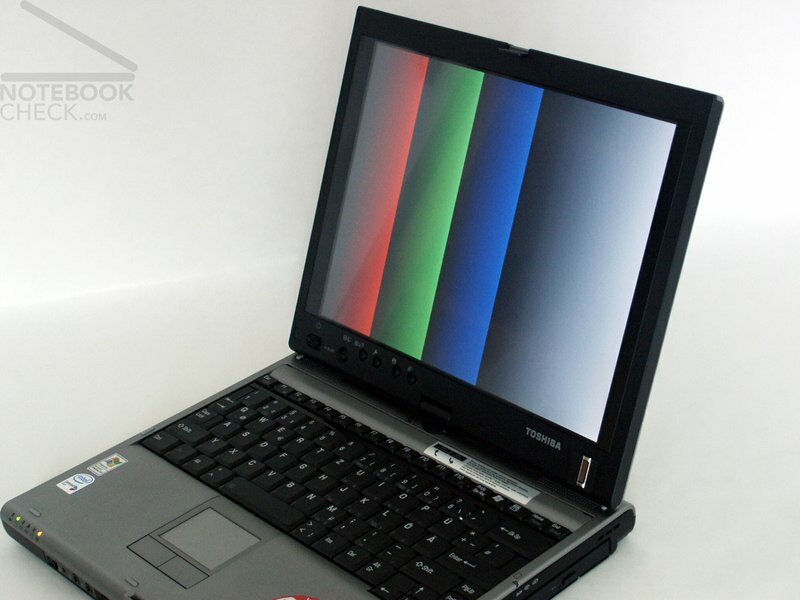 The 12.1 inch display with a maximum resolution of 1400x1050 pixel has a moderately reflecting surface. With maximum brightness the display seems to be almost a bit over-radiated. If one reduces the display brightness by some levels, the image contrast suffers from it very fast. As maximum brightness a value of 148.4 cd/m² was measured, with a good illuminating of 83.8%. The maximally achieved contrast results in 247.3:1. The measuring diagram of the color representation shows, that one can recognize that both the red one and the blue color curve deviate clearly from the ideal line. However, the slightly falsified color reproduction was not visible with the naked eye. 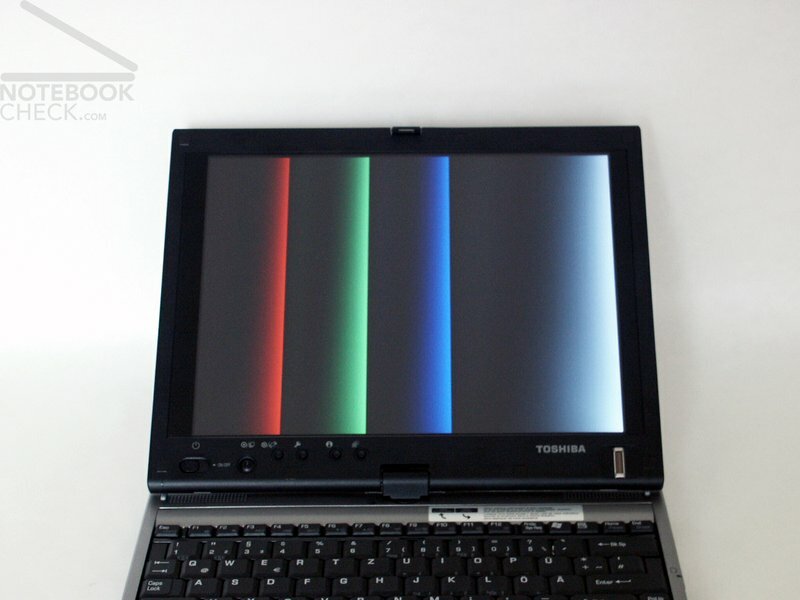 The reaction rate of the display is slightly below average with achieved level 5 in the Pixperan readability test. Despite the designation "Wide Viewing Angle" only a moderate stability with viewing angles is noticeable within the vertical range. Besides a general clarification also a coarse representation of text can be observed when viewing from above downto the display. 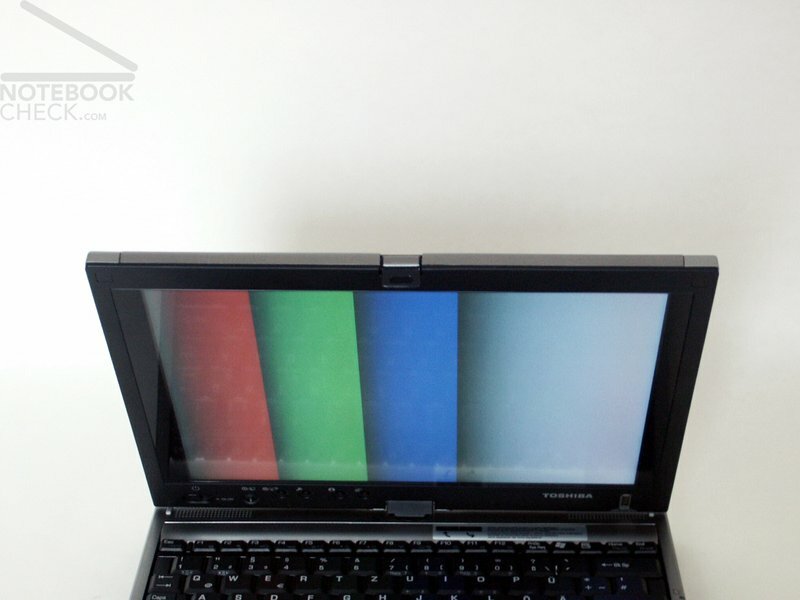 Within the horizontal range the 1400x1050 pixel display shows a good stability of viewing angles. In addition, apart from the picture-specific factors, it was noticeable, that the touch display can be handled exclusively with the provided Tablet PC pen. With the already tested Flybook A33i this was possible also with other items. 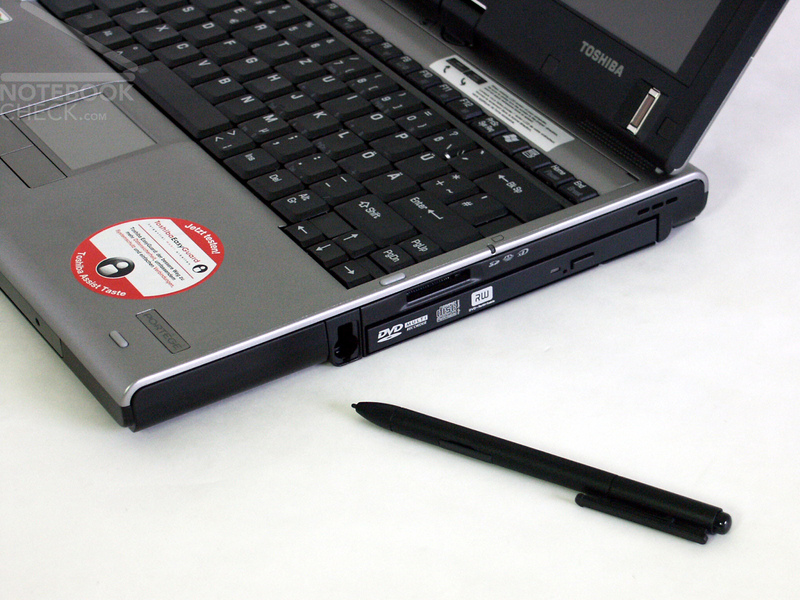 If the Tablet PC pen should be lost, Toshiba took precautions and added a second pen to the package. The outdoor handling with very bright environment light became extremely troublesome. Due to the reflecting surface impairing reflections arised. Also the rather moderate brightness in the border regions contributed to bad legibility. 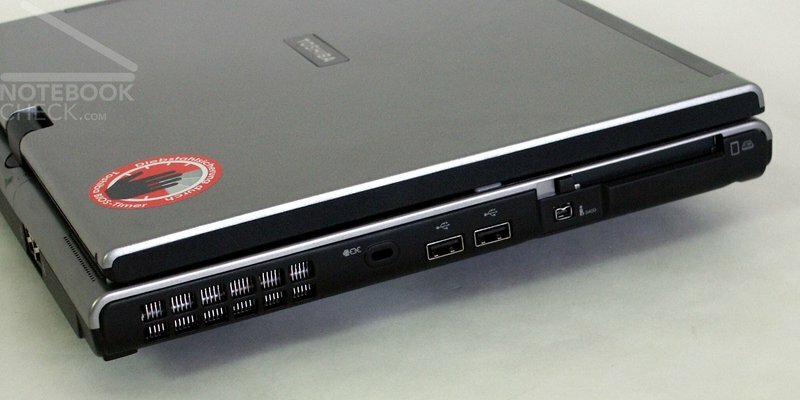 If it makes sense to judge sub-notebooks with integrated graphics solution according the 3D-performance, the Toshiba Portege M400 is rather at the lower edge of comparable configurations. 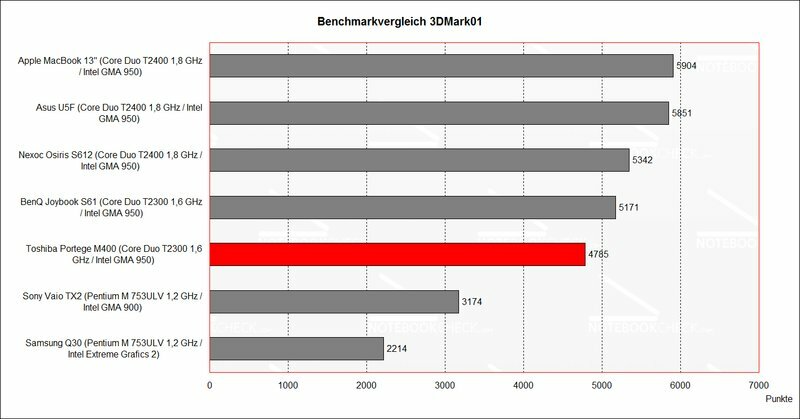 Concerning the application performance the notebook is better than BenQ Joybook S61 (identical CPU/video unit) and only scarcely behind class colleagues with the stronger T2400 Core Duo CPU with 1.8 Ghz. Thus, the Portege M400 supplies sufficient performance for all office applications, and can be compared with class competitors. The hope for a whisper-quiet Core Duo 12 inch notebook vanish fast. 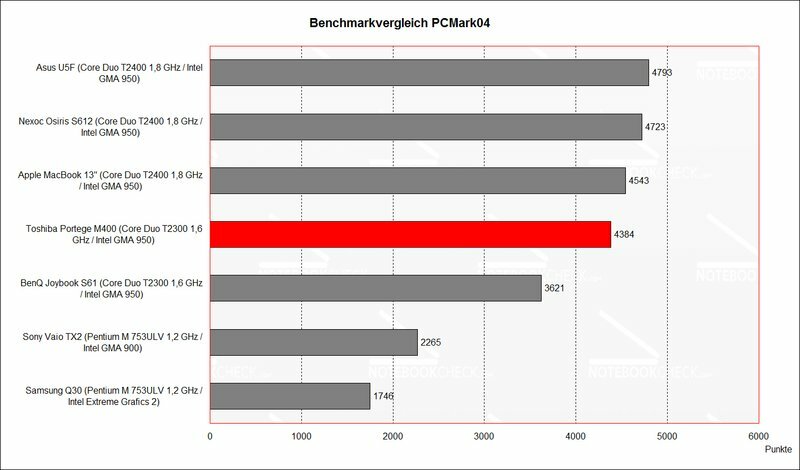 Already after short time the fan starts in the Portege M400 and then runs almost continuously. Interesting is, that also without considerable load the exhaust air stream is hardly recognizable hot. With longer time under load then a noticeable exhaust air warmth is to be determined, the fan nevertheless always keeps the same number of revolutions. The sound emissions of M400 are rather poor. The represented sounds are thin and the maximum volume is not convincing. Headphones urgently recommended! 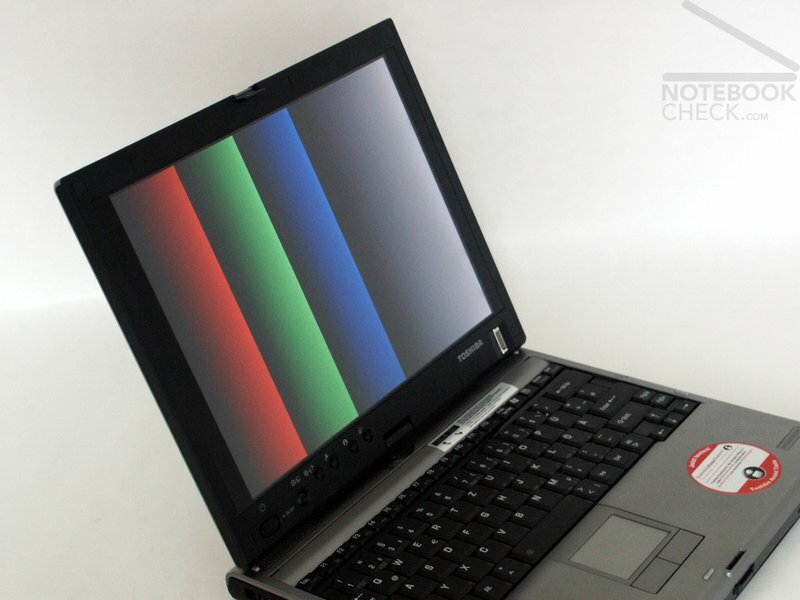 Toshiba Portege M400 achieved average, but acceptable battery runtimes in the test. 2.5 hours of DVD playback, over 3 hours Wlan operation and maximally clearly over 4 hours network-independent handling should be sufficient to some extent. Nevertheless, with somewhat more than one hour the running time under load was quite low. 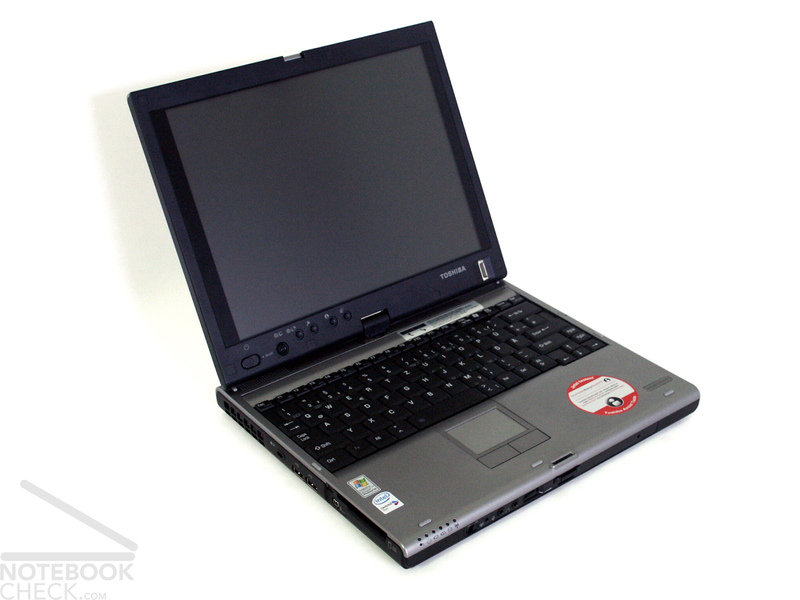 For us, the Toshiba Portege M400 remains as a interesting notebook in memory, rich in variants. Nonetheless, it has its faults, too. 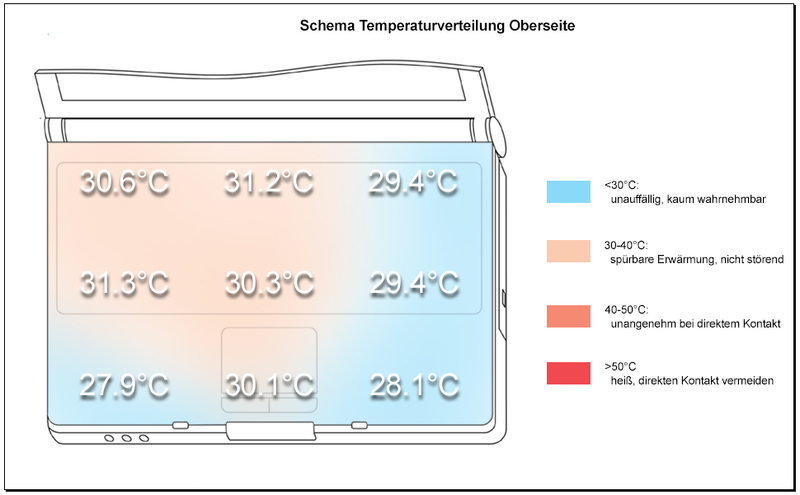 The display solution with turning folding hinge and direct input mode expands the possibilities for applications, compared with a conventional sub-notebook. 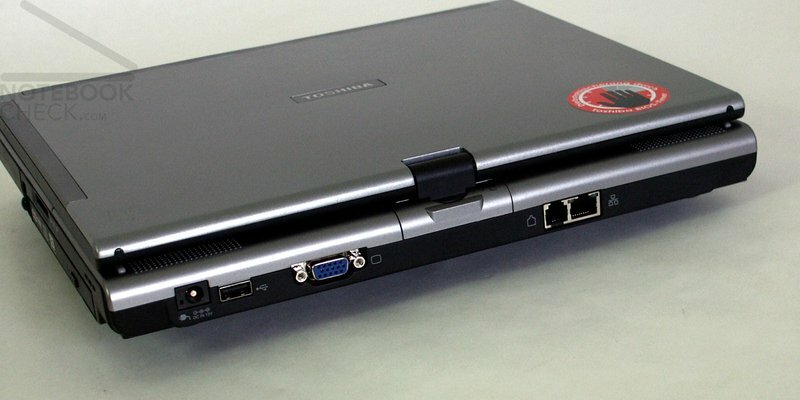 According to my opinion, the Portege has the potential for a "revolution" in notebook design. 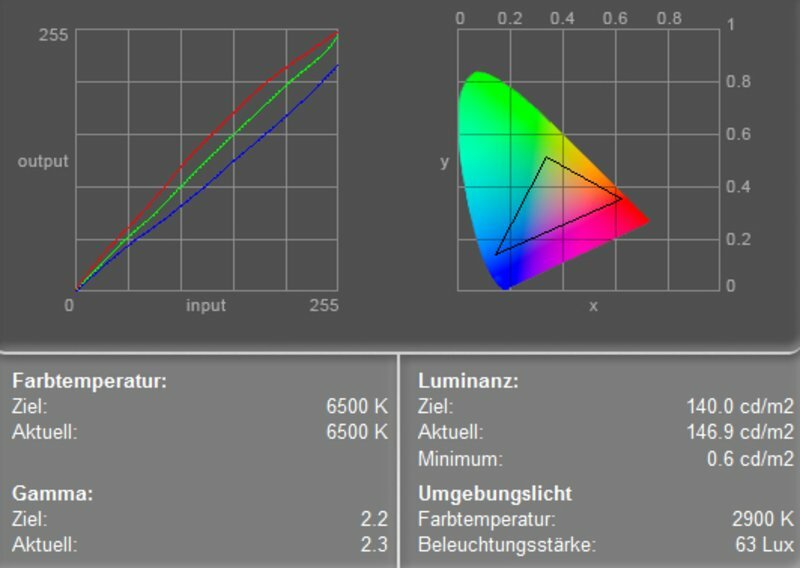 The display results good values in measurements concerning brightness, illumination and contrast. However, the stability with viewing angles could be better, particularly in the vertical range. 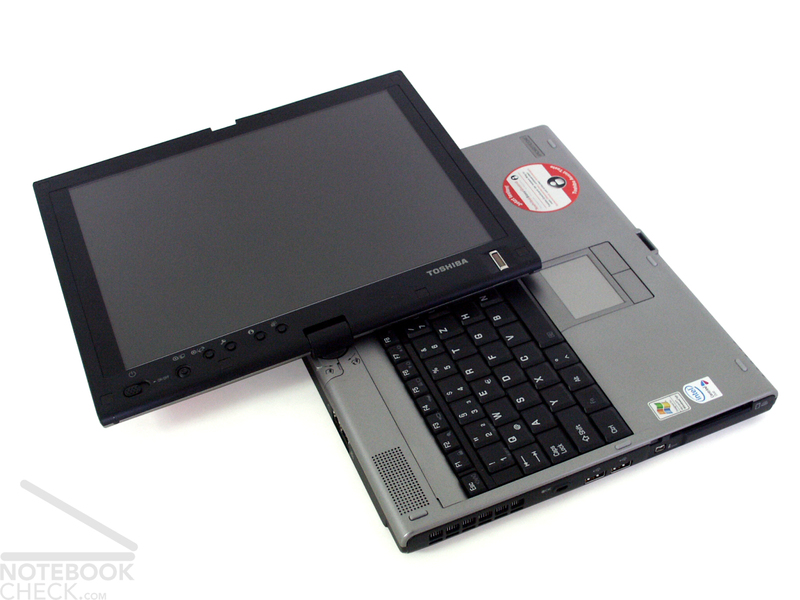 This would make the Portege M400 more user-friendly in particular the use as Tablet PC. Concerning the workmanship the M400 can't divert with the good surface quality cannot divert from smaller lacks. In addition, there are a somewhat pressure-sensitive case and an absolutely unnecessarily wobbly battery. 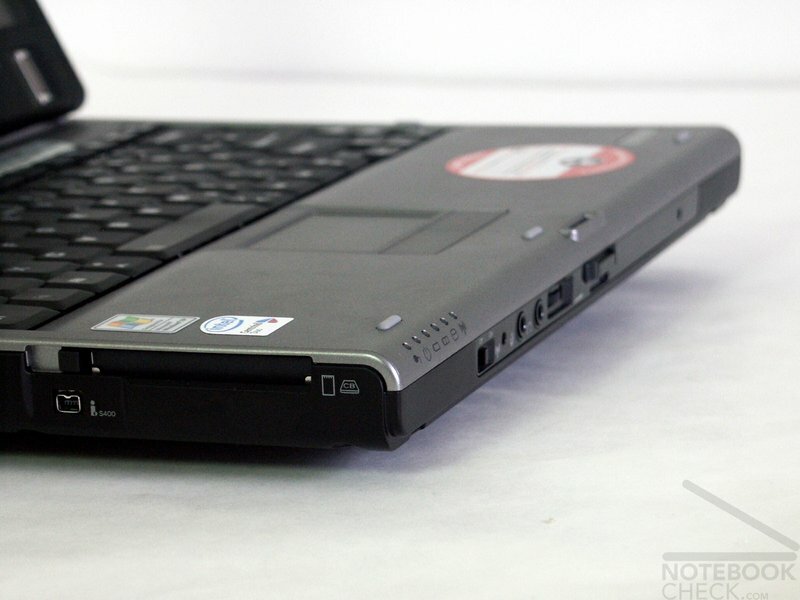 Most disappointing is the noise ambience of the Toshiba Portege M400. Straight with a Tablet PC it should be possible to study documents almost loudlessly and enjoy easy office aplications. A constantly on the same level running fan, independentl from the performance is hardly understood by us. Unweary: The fan of the Portege M400 runs permanently, even without load. Even at the bottom of the notebook no remarkable heating can be observed. The Tablet PC pen can be stored in an opening at the right side of the case and so is available everytime. The keyboard has too small keys and is not positioned firmly. Positively: The display can be locked normally, but also in Tablet PC mode. Nevertheless, the case is compact and solidly manufactured. can not divert from minor lacks of workmanship. 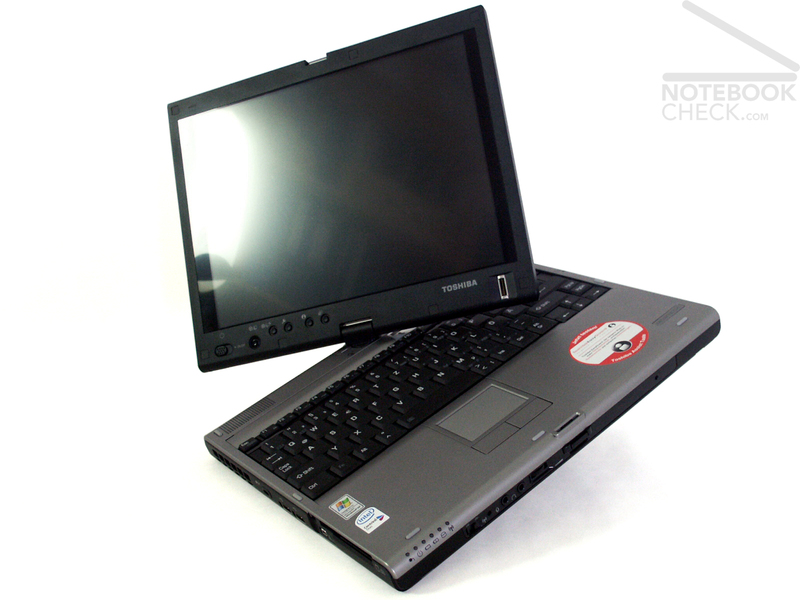 ...or completely alternative - the Toshiba Portege M400 offers all. 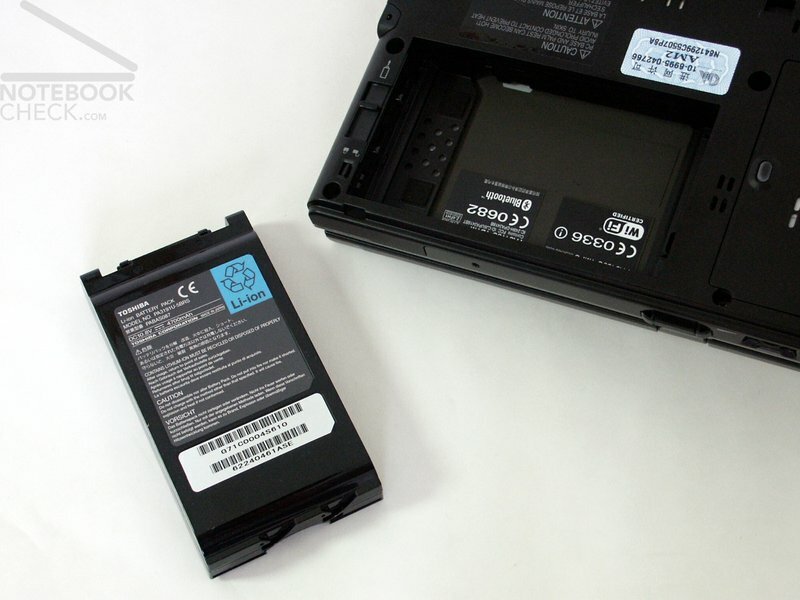 Good battery runtimes due to the 4700 mAh lithium-ion battery.